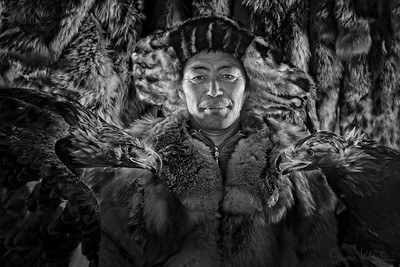 Nestled in the snowy mountaintops of Western Mongolia, the Kazakhs have mastered the ancient and noble art of hunting with eagles. For nomadic tribes, their survival depends not only on training these majestic birds but in passing on their skills to the younger generation. For centuries, this knowledge has been transferred from father to son, but that’s all beginning to change. 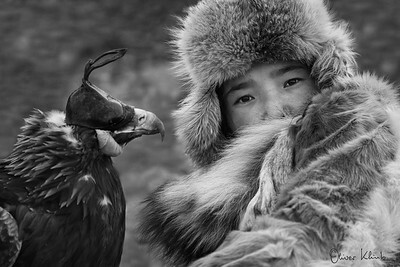 The young women are becoming Bürkitshi, the Kazakh word for eagle hunters. This shift is no accident. Eagle hunting has slowly transitioned from a means of survival to a sightseeing attraction. This influx of commercialism has altered their trading power and divided the community. No longer are they exchanging goods and furs, now they are earning currency through tourism. 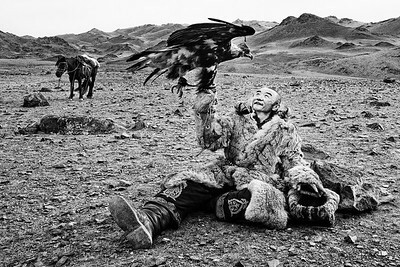 Teaching the art of eagle hunting to women makes the Kazakh even more interesting to tourists and prevents the sport from becoming diluted or dying out completely. 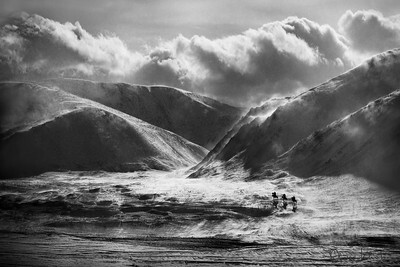 These images are a glimpse into the soul of the hunters in a time of rapid change. 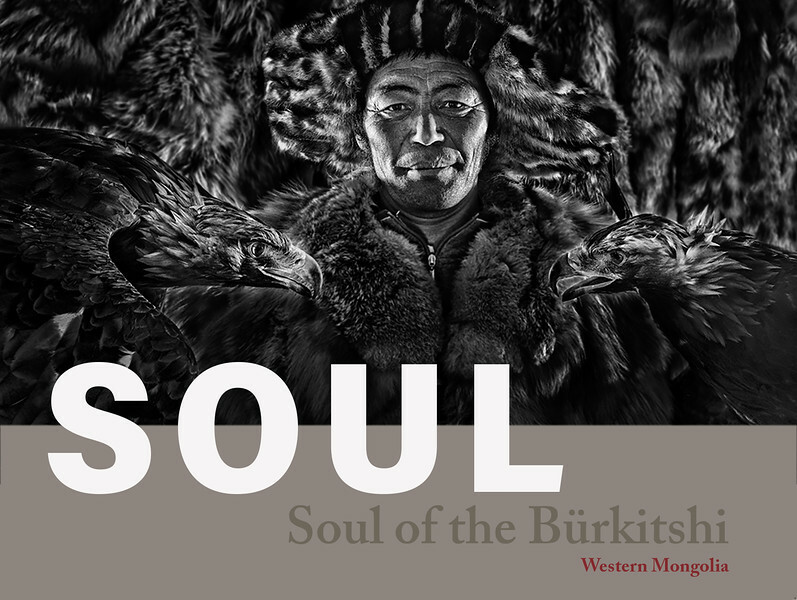 There is a deep bond and a rich unspoken language between the Bürkitshi and their eagles. 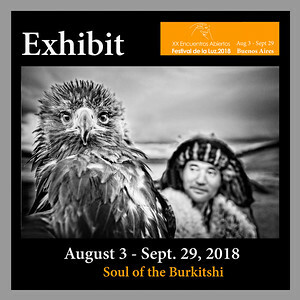 Yes, the hunt is violent, but the Bürkitshi’s intimate connection with their animals instills the sport with a sense of grace and art. 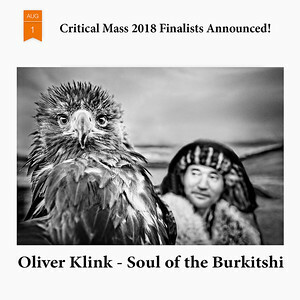 For those that truly live as Bürkitshi, the future doesn’t faze them. They still hunt in the way of their ancestors, migrate through the rugged terrain and share stories over cups of fermented mare's milk and baursak (fried dough balls). 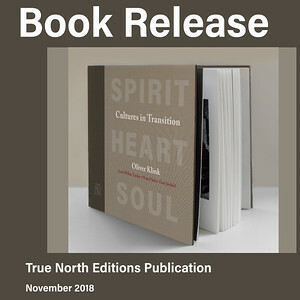 Only now, these stories are also being told thru the soul of the new huntresses. 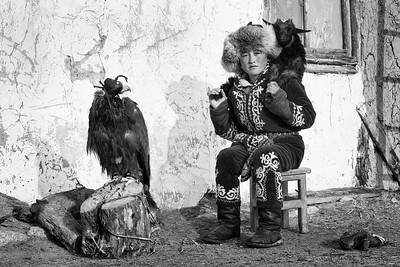 For centuries Bürkitshi (eagle hunters) have been hunting with their eagles during the frigid winter months for subsistence and fur (foxes, wolves, hares). Eaglets are captured from their nests high in rocky crevices. Only female birds are selected, as they ultimately grow to be larger than males, giving them an edge as hunters. The bond between hunter and bird is deep; she answers only to the hunter’s voice. Kulzira was our cook. 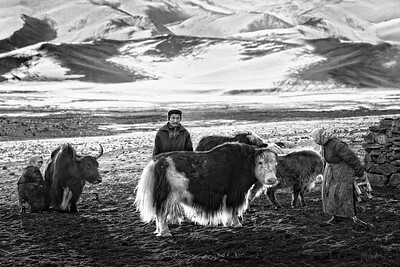 She understood our needs for a balanced diet that is contrary to the Mongolian belief: “Meat is for men and grass for animals." 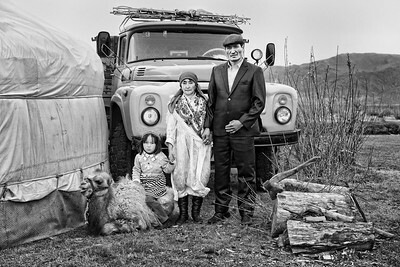 Several generations of families customarily live together in a nomadic camp known as khot ail ("group of yurts"). 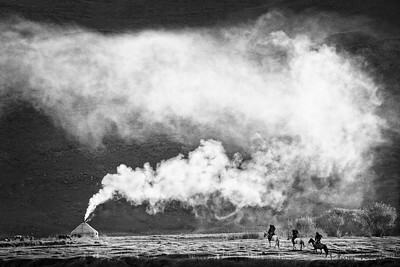 The camp, generally consisting of two to seven households, serves as a way of pooling labor for herding and hunting, and has numerous social and ritual functions. 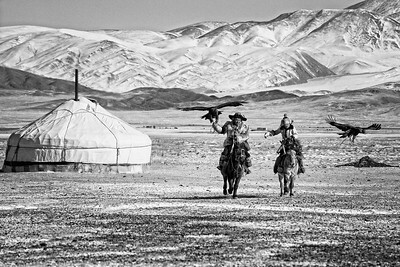 The ger (also known as üy in Kazakh) is part of the Mongolian national identity. 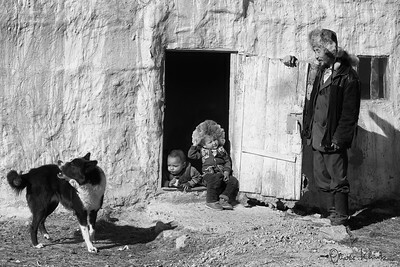 Even today a large share of Mongolia's population lives in gers, including in the capital, Ulaanbaatar. Ger means home. It is the place where people cook, store food, sleep, and share stories with neighbors and visitors. A basic wood stove, fed with cow paddies, keeps the inside warm – barely enough during the cold nights. 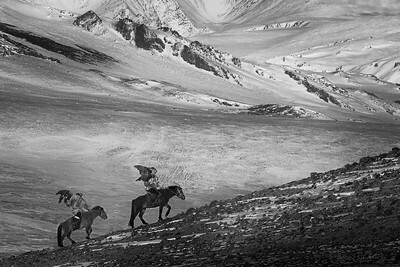 Overgrazing of Mongolian lands in recent years has meant there is less wildlife to hunt, and the arrival of tourism has also brought pressures for wildlife preservation upon the Kazakhs. Children are moving to the cities to earn incomes to supplement their livestock farming, making hunting less vital to survival. In less than 20 years, the tradition of eagle hunting could vanish. After 7 to 10 years, the hunter releases his eagle back into the wild. As the eagle was trained to hunt, she will survive in the wild, find a mate, and live out the rest of her days, typically up to a decade. The release is an emotional ceremony and the hunter has to make sure that she doesn’t follow him home. 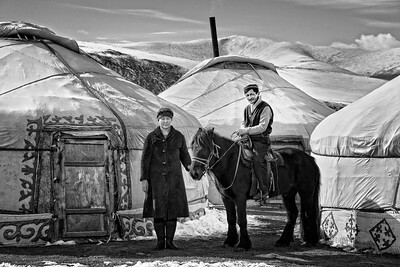 For many centuries, there has been a customary gender division of labor in this nomadic pastoral society. Men typically handled external affairs including military, administrative, and trade matters. Men were also primarily responsible for herding animals, hunting, slaughtering animals, and maintaining animal shelters. Repairing carts, tools, and weapons was also considered men's work. Women were responsible for housework, milking animals, making dairy products, cooking, washing, sewing, and nurturing children. Roles are morphing, as work needs to be done to survive. 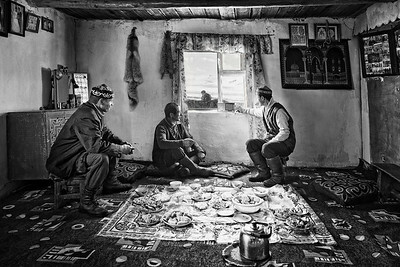 Food is an important element of the Kazakh hospitality tradition. When guests arrive, the household sets out a special bowl containing homemade cheeses, flour pastries (baurzak), sugar cubes, and candy. As a guest, you are obliged to part take in drinking Vodka shots and mare's milk (kimiz). I learned rapidly that pacing myself was not impolite and would keep me sound longer, as my cup kept being refilled. 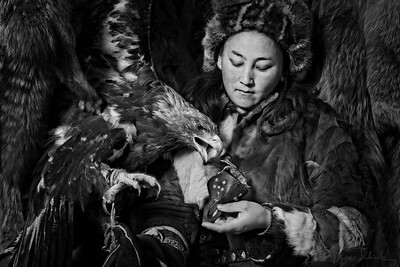 Khaizim has a strong work ethic taking care of her parents and learning the tradition of eagle hunting. 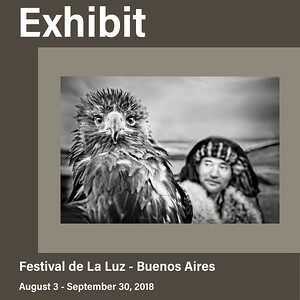 Eagle hunting is traditionally passed down among male relatives. Female hunters are rare but there are no religious or cultural prohibitions against a girl who wishes to train and fly eagles. She started riding horses at age three and got her first eagle at age 10. Her outfit is made of animals’ furs she hunted herself. 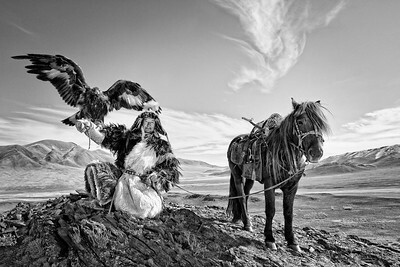 Aigerim is drawing her inspiration from Aisholpan, the first eagle huntress who competed in the Eagle festival in Ulgii in 2014 and was featured in the 2016 Eagle Huntress documentary. 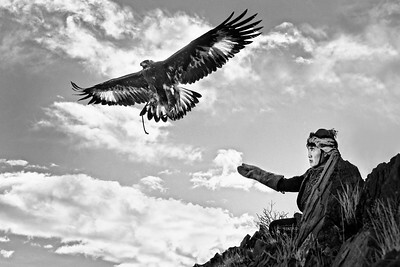 While there were many old Kazakh eagle hunters who vehemently rejected the idea of any female taking part in their ancient tradition, Aisholpan's father, Nurgaiv, believed that a girl can do anything a boy can, if she is determined. Asker, Aigerim’s dad, is a firm believer that his daughter should not only become an eagle huntress, but also get educated. 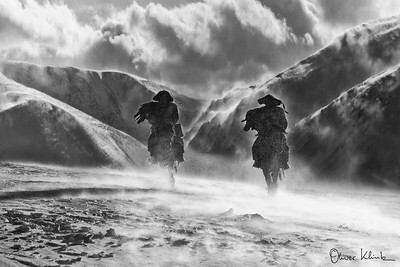 “A fast horse and a soaring eagle are the wings of a nomad” is a Kazakh proverb. 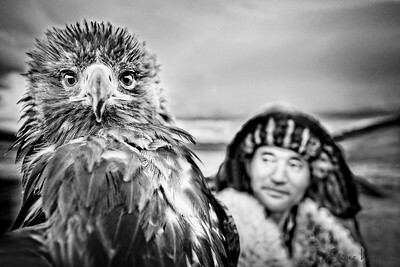 The Eagle Festival takes place every October in Ulgii, where close to 80 hunters gather. 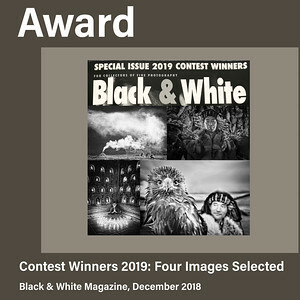 After two days of grueling competition where the bonds between the hunters and their eagles are tested, the title of “best eagle hunter of the year” is awarded. More than the competition, the gathering is an opportunity for hunters to share stories and compare notes on their hunting practice. 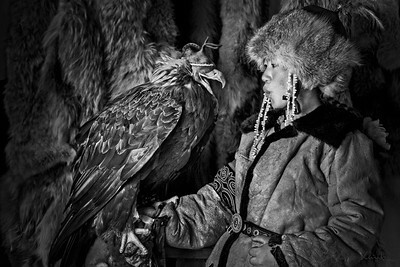 Aigerim and her dad, Asker, captured her eagle as a chick. Training a raptor is a complex undertaking. She has to forge an intimate relationship with her bird, who will respond just to her voice. She began on foot, learning how to balance the eagle on her arm. She then graduated to continuing the training on her horse. 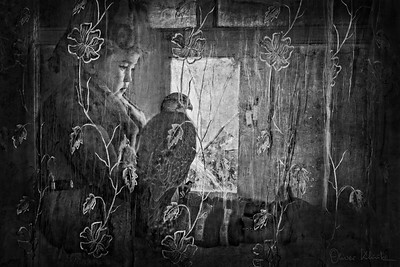 But she is not yet fully ready to go hunting with her dad and be one of the fewer than 100 true eagle hunters left in Western Mongolia. Boys used to have a clear path. Their father would train them to become eagle hunters. 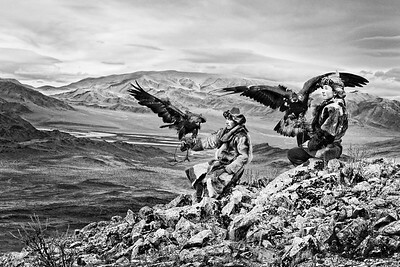 Nowadays, life is more challenging as the tradition of eagle hunting is disappearing. Many parents send their kids to the big cities for schooling and to earn a living. The harsh life of raising cattle, hunting, and taking care of the extended family is often replaced by the loneliness of living in a city. Historically, elders would be cared for and the cultural pattern of inheritance was “ultimogeniture” where the youngest son would typically inherit the largest share of the parent's animals, the ger, and the winter camp. Today, there is a greater variation in inheritance depending on personality considerations and the economic and living circumstances of different family members. The eagle hunter has two boys and enjoys spending quality and joyful time. But at one point, he will have to make a big decision about who will inherit his animals. This eagle hunter traveled over 100 miles to attend the Eagle festival, two long days of lonely travel. His family couldn’t make the journey as they had to repair their winter home. While he is a true Eagle Hunter, for a few days he was a tourist attraction showing his eagle and being paid by the tourists for a photo or two. Soon, he had to go back home to his traditions, braving the harsh winter months and difficult work.